Deco Bioglitter® SPARKLE is a special TECHNICAL grade of Bioglitter designed and formulated specifically for general industrial coatings, printing or paints. It utilises our unique plant derived film to offer a brilliant, eco friendly glitter without equal in the industry. The product has been independently proven to biodegrade in the natural environment, it contains very low levels of heavy metals because of it’s cellulose content and is formulated to offer more resistance for use industrial coating and printing processes than other Bioglitter products. Already 92% plastic free and we are working to remove the last bit of plastic to become totally plastic free. 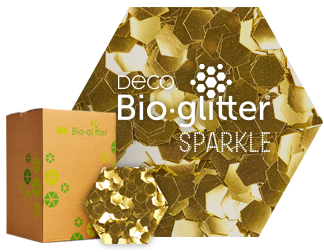 This will improve the biodegradability performance, allowing Deco Bioglitter SPARKLE to become certified as Cosmetic Bioglitter PURE already is.